In Mexico, there are thousands of people who need an artificial leg, but don't have the money to buy one. 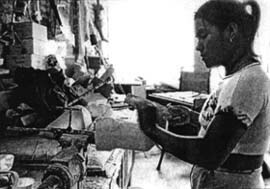 A modern above-the-knee prosthesis often costs a farm laborer or factory worker twice his or her yearly wages. The PROJIMO team has experimented with different kinds of low-cost legs. 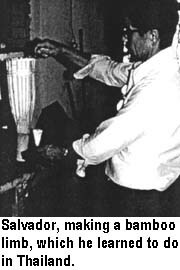 They sent a villager to Thailand to be an apprentice for making bamboo limbs, molded leather sockets, and wooden knee-joints. (All of these are pictured in the book, Disabled Village Children.) Some of the "appropriate technology" legs worked very well. But - alas! - most people did not like them: they said they looked too primitive. They had seen fancy limbs made of fiberglass, and they wanted something "modern." 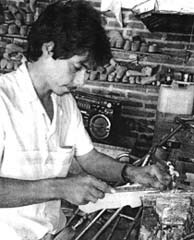 In response to users' wishes, PROJIMO arranged for a team member, Florentino, to apprentice for two weeks in a limb-making shop in a distant city. There he learned the basics of making fiberglass-and-resin limbs. When he returned, Florentino improved his skills by trial and error. He shared what he knew with Marcelo Acevedo, who in time became a master limb-maker. Marcelo, in turn, taught Guadalupe (himself an amputee), Conchita (see Chapter 42), and others. PROJIMO has been able to fit persons with modern fiber-glass legs at a much lower cost than they could find elsewhere. While quality varies, these limbs tend to be better than those made at much higher cost by professionals in the cities. Two government rehabilitation programs have contracted with PROJIMO to fit their clients with these artificial legs. The PROJIMO leg-makers (mostly disabled) have had little formal training, They learn by doing. Although their technical skills may not equal those of highly trained technicians, it is their relationship with the persons receiving limbs that makes all the difference. Often the person stays several days, and becomes involved in fitting and building the limb. After it is done, she spends the next days at PROJIMO learning how to walk with it. Efforts are made to fix any problems, even when this means remaking the leg. A good limb is the result of a close working relationship between builder and user. 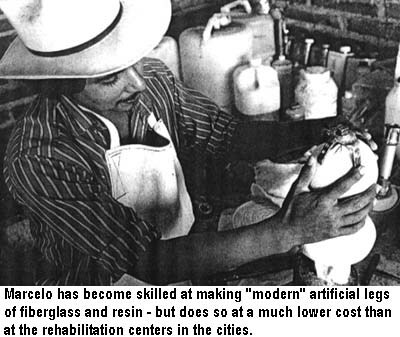 Marcelo and the other limb makers at PROJIMO have devised several techniques for making modern fiberglass-socket limbs at lower cost. Whenever possible, they try to get high-quality knee-joints from discarded limbs (often those of elderly persons with diabetes who have died). Support persons and groups in the USA and elsewhere are on the lookout for second-hand joints, foot pieces, and other parts. Where such recycling is possible, top-quality limbs can be provided at affordable prices. To make a limb that fits well, the first step is to cast the person's stump. First, the technician makes a "negative" (hollow) cast of the stump by wrapping a plaster bandage over the stump. Next, the technician makes a "positive" (solid) mold, by filling the hollow cast with plaster. The team has found ways to keep down the costs. 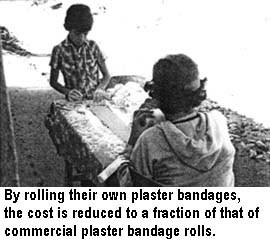 First, they have experimented with roll-your-own plaster bandages, rather than buying expensive commercial plaster bandages. 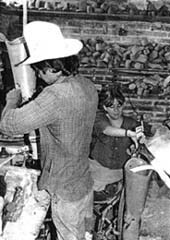 With these home-made plaster rolls, casting the stump is somewhat more difficult, but the cost is only about one tenth that of the commercial equivalent. The time it takes for the plaster to set (that is, to get hard after wetting it with water) can be controlled in 2 ways. To speed up the setting time, add a small amount of salt (ordinary table salt) to the unset plaster powder. Or add a little powder from old plaster that has already set. (The dust that collects from filing plaster molds works well.) CAUTION: Hot weather or warm water also speeds up the setting time, so local experimenting is necessary. 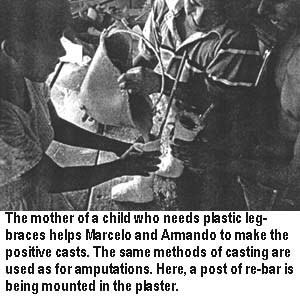 For making positive casts, the village leg-makers use low-cost plaster sold for building houses; instead of costly orthopedic plaster-of-Paris. Most limb makers, when they make a positive cast, put into it a 1/2 inch metal water-pipe. 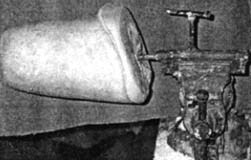 The pipe is used to grip the heavy stump-cast in a vise while it is being "modified" (shaped into a form for molding the socket). Instead of the metal pipe, PROJIMO uses re-bar (reinforcing rod, used in the cement walls of buildings). It is cheaper. Problem: To position and reposition the heavy stump cast while modifying it to form the mold for the socket of the artificial limb, a clamp is needed to hold it securely. 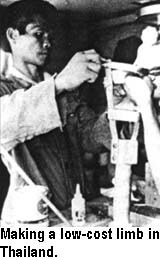 Most high-class prosthetic (artificial limb) shops have a strong, factory-made clamp. But this is expensive (the equivalent of about US $130). 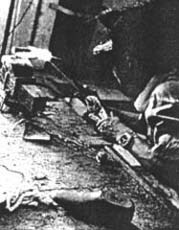 For this reason, PROJIMO's leg-makers simply used a bench-vise to grip the metal rod which they had molded into the cast. However, with the force used in filing and shaping the cast, the bar often slipped in the vise. Also, the cast needed to be rotated repeatedly during modification. To do this, the vise had to be loosened, and the heavy cast had to be held in the right position while tightening the vise. For a big heavy cast this often took two persons. Solution: One time a North American limb-maker, John Fago, was visiting PROJIMO to help the team up-grade their skills. John is an amputee who first came to the project as a photographer. (Several photos in this book are by John.) After visiting PROJIMO, John decided to get training as a prosthetist, in order to help in the development of low-cost, high-quality limbs, (He now runs a small, non-profit program called New Legs for Nomads.) Marcelo explained to John the difficulty he had in trying to hold the stump-cast in a bench vise. Together, Marcelo and John set about designing a simple stump-cast clamp which would hold the cast securely, yet also allow it to be easily and quickly repositioned. Usefulness elsewhere. The clamp was put together out of scrap metal in about 1 hour. It works remarkably well, allowing the cast to be effortlessly rotated and re-clamped. The innovation proved so popular that Javier, who worked in the brace shop, took one look at it and immediately made one to hold casts for making orthopedic appliances. 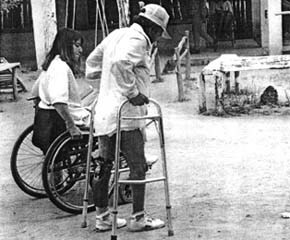 A few months later, John Fago took his photos of the clamp to Cambodia (where tens of thousands of people have lost their legs from stepping on land mines - see page 173). Limb-makers in small shops there faced similar problems and, on seeing the photos, at once made their own cast clamps - adapting the PROJIMO design to local materials. So PROJIMO, which had originally taken some of its appropriate technology ideas from grassroots limb shops in the Far East, was able to return a useful innovation. 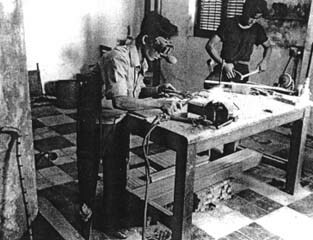 John Fago showed photos like these of PROJIMO's stump-cast clamp to village limb makers in Cambodia. When the Cambodian limb-makers (who also had disabilities) saw John's photos, they realized how much easier it could make their work, and promptly made their own, as shown here. 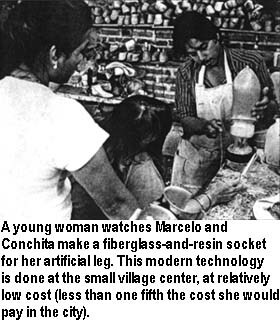 Conchita and Marcelo have worked hard to learn how to make modern fiber-glass-and-resin limbs, because this is what people say they want. Before she finishes a limb, Conchita makes sure it fits well. Walking is easier with the arms straighter. *CAUTION: Reviewers of this book have rightly pointed out that this man's walker is too high (as are the crutches of the smiling boy on page 273). His elbows are bent far too much. For easier walking on walkers, crutches, or parallel bars, usually the arms should be nearly straight (see page 11). Conchita, of course, could argue that the high walker encourages its user to bear more weight on his new leg. What do you think?